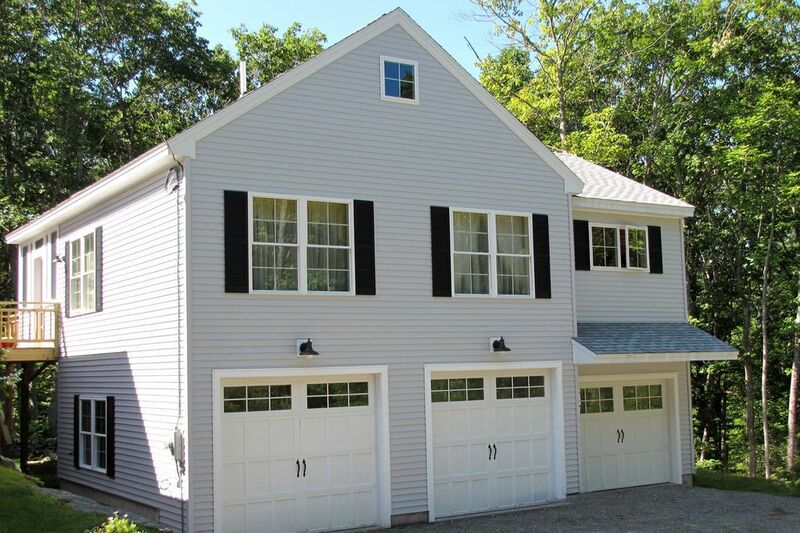 Our property is located on quiet Back River Road in Boothbay. This apartment is above a 3 car garage connected by a large deck to the owner's home. The lot features large, hardwood trees, birds and some small wild animals. Enjoy the serenity! Area Description: Four miles away are the beautiful, tourist attractions that only Boothbay Harbor can offer. See the 'locals' working their lobster boats and notice all the larger cabin cruisers docked in the harbor too. Go on a whale watch, an island lobster bake, shop in the unique stores, sample some homemade ice cream, candies and flavored popcorn. Plan a visit, to the beautiful Coastal Maine Botanical Gardens. The Gardens feature magnificent displays and a beautiful waterfront location, many state of the art gardens, a children's garden, a butterfly exhibit, a gift shop a cafe/restaurant and so much more. You may also enjoy the Boothbay Region Land Trust. It offers 15+ properties for your hiking and outdoor enjoyment. The region also features the Boothbay Railway Village, Dept. of Marine Resources Aquarium, several parks, beaches, a YMCA, and freshwater swimming. Don't forget to enjoy our fresh local seafood and hospitality while you are here. Outlying areas: Maine boasts not only coastline, but mountains, rivers, lakes and a desert, yes a desert. When you arrive here you will see there are endless opportunities for outdoor and indoor entertainment. If you are here to relax and enjoy the quiet way of life, that is available as well. You have to see it to believe it! Kevin and I have lived in the beautiful, Boothbay Region since 1993. We love it's quaint New England fishing village appeal as well as it's close knit community that welcomes thousands of visitors every summer. We are currently the caretakers of our parent's retirement home. Mom and Dad are currently living in Virginia Beach. When the time is right they will move here to be closer to family. We live in the bigger home in the front, mom and dad's house is behind us over the garage. We love our quiet little neighborhood just yards from the coast. We can't see the water from our home, but a short walk or drive brings us all the beauty of coastal living. The height of this home will allow you to have a bird's eye view of the the tree tops. Watch birds and squirrels scamper about on the branches of our many oaks and maples. The home is located on a dead-end ocean inlet. The ocean is a short distance away a 7 or 8 minute walk. Downtown Boothbay Harbor is less than 5 miles away. An Irving station and the big grocery store is located less than 3 miles. Traffic is minimal. Within 2 miles there is a beautiful town playground. Owl hoots, crickets and croaking frogs disturb the quiet of evenings and nights in our surrounding forest. The master bathroom was constructed to meet the needs of a handicap individual, it has railings for safety near the toilet and in the shower. A short walk away . A saltwater bay inlet. Two can sit indoors at the pennisula; 4 or more can comfortably dine outdoors on the Screened In Porch. In order to access this beautiful apartment you must climb a minimum of five stairs from the front of the owner's home. This stay was just a great as the first 2 (July 2017 and November 2017). About the only difference was there was snow on the ground and was colder outside. Inside we were nice and toast warm. As we arrived, we were greeted with a pretty evergreen wreath with a red bow on the door. The wreath said to me "Welcome" to your Home Away from Home. A few additional touches were added one of which were corner shelves in the master bedroom. Nicely done. Thanks again to Becky and Kevin for offering this house. Perfect, everything we needed for a family of 4 including two little ones. My husband and I spent eight nights at this cozy rental out in the country outside of Boothbay Harbor. The owner is pleasant and straightforward to deal with and responsive. We were pleased with the proximity to the botanical gardens, the screened porch, the deep quiet and peace of the location, and the good cable channels. FYI: Although the owners had several options for WiFi, coverage was poor--in fact, my Bluetooth reception was really poor, too, throughout the peninsula. Arrived to a very welcoming, peaceful and beautiful getaway home! Special attention to details and you will need nothing but your favorite book!! 1. Countryside was very beautiful, location was great for getting around the region. 2. Plenty of rooms. We were comfortable with the layout. 3. Place clean when we arrived. The Boothbay Region has been a destination for travelers for over a century. The unique character of our rocky seacoast makes it a pleasure to enjoy from both land and sea. The Boothbay Region is found at the end of a peninsula in the Midcoast area of Maine. It is a picturesque area with rich maritime heritage. The region boasts several festivals which celebrate this heritage. The architecture of the region reflects the charm of a New England fishing village with white, clapboard homes, specialty shops, galleries, boat yards and marinas. You won't want to miss our beautiful Coastal Maine Botanical Gardens, amazing whale watches and harbor tours. If you love to golf you need to play a round or two on our state of the art greens at Boothbay Harbor Country Club. We are keeping our home open and available for the Boothbay Region Festival of Lights this season. We plan to put some Christmas decorations and lights in the home for our holiday visitors. The region will be open for you eating and shopping pleasure. Coastal Maine Botanical Gardens will be putting on a fabulous show for you too!